Luther Park Camping & Retreat Center is a Christ-centered outdoor ministry of the ELCA (Evangelical Lutheran Church in America), located in northwestern, Wisconsin, on the shores of beautiful, spring-fed lake 26. Surrounded by hundreds of acres of forest land and trails, the camp is seven miles east of Danbury, Wisconsin, and 118 miles northeast of Minneapolis, Minnesota. The area is home to an outstanding variety of plants and wildlife and is an excellent site for nature study. The camp was incorporated in 1958 by an association of Lutheran congregations in the Minneapolis area to function as an extension of the parish life and ministry of the constituent congregations. Over the years, congregations located in St. Paul, northeastern Minnesota, and northwestern Wisconsin have also become corporate members of this Christian outdoor ministry. Campers and retreaters who come to Luther Park live together in small groups, participating in worship and learning activities as well as in relationship-building and recreational opportunities. Each individual is challenged and given the opportunity to speak out, to take part in leadership, to experience spiritual growth, to develop outdoor skills and to grow socially. Programs are hosted by staff members who are chosen for their maturity in the Christian faith and their maturity as people as well as for creativity, commitment to youth and special skills and talents. Staff and campers work together with the help of God to create an intentional community where the love of God and God’s people is an experienced reality. b. 1958 - Representatives from 30 churches in the Minneapolis District of the Augustana Synod were invited to an organizational meeting regarding establishment of Luther Park, Inc. Fourteen churches approved joining, 12 showed "no answer" and four were still "in process." June 1959 - Luther Park becomes a reality! The Luther Park Board voted to purchase the Luther Park property, "approximately 160 acres, more or less...for a total cost of $35,000." 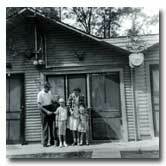 June 1960 - Board authorizes borrowing up to $75,000 for construction of four cabins, Food Service building and well. May 1961 - Dedication Service for Luther Park at camp. A "Moment of Dedication" celebrated in each member congregation. 1962 - Camp sold bonds to raise funds for building/renovation projects. 1970 - Zion Boy Scout Troop 106 planted 1,000 trees. 1971 - New blacktopped Sports Area added for basketball, volleyball and tennis. Oct. 1975 - Board adopts first long-range plan, the Brauer Master Plan. 1979-1985 - Pastor Randy Gullickson serves as first full-time executive director. 1982 - Changed from clergy board to combination of lay and clergy. 1986 - First Phonathon organized. 1988 -Joel Legred hired as executive director October 1. 1989 - Lodge roof rebuilt, insulated and re-roofed. 1990 - Log House renovation begins. Day Camp and Journey of the Cross programs begin. Installed forced-air furnaces in four cabins. Elm cabin renovation by Elim. Began publication of Echoes newsletter. 1992 - Received ELCA Award for Multicultural Ministry. Hired Miller Creative Communications as communications consultant. Began Echoes newsletter for campers & friends of Luther Park. 1993 - Accepted updated Brauer master plan at annual meeting . Hired Gronlund, Sayther, Brunkow to assist with financial development. Established Point & Cross Giving Club. Began construction on director’s house; house completed May 1994. 1994 - Donation received of 20 acres of land. 1995 - Funds donated to build deck on Lodge. Deck constructed in 1996. Begin Teens in Mission (TIM Team) program. 1995 - Re-roofed Maple cabin. 1996 - Approved new By-laws and Articles of Incorporation. Fir cabin roof and renovation by Richfield Lutheran Church. Installed new windows in lodge basement. Re-roofed three more cabins (Ash, Birch, and Elm). 1997 - Built pole barn. Added development/communication position. First Point & Cross Thank You Dinner; issued plaques for ’96. Installed new sign at entrance. Completed re-roofing of final 2 cabins. First year of Cornerstone program. Started construction of first Tree House. Began publication of Reflections newsletter for Point & Cross Club members. Sold 20 acres donated in 1994. 1998 - Built one Tree House, finished another started in 1997. Installed septic system for Shower House. 1999 - Luther Park celebrates 40 Years of Fabulous Blessings!!! 1999 - Tree harvesting began. Completed remaining Tree Houses for Tree House Village. Built outside shell and interior plumbing of Bath House. Purchased and installed walk-in freezer and prep. table for kitchen. Purchased 180 chairs for dining hall. 2000 - Tree house village dedicated and begins operation. Picnic shelter constructed between Tree House Village and Campground. Decks on Pine and Fir cabins. Removed underground oil tank for Lodge; installed new propane furnaces in Lodge. Installed new septic tank for Lodge bathroom. Tiled lodge bathroom floors. Carpeted Lodge fireplace room. Received donation of house and double garage. Web site complete and goes online. 2001 - New bunk beds for Hickory, Birch, Elm & Oak cabins. New lighting in Oak & Hickory cabins. New bathroom fixtures in Oak cabins. Replaced all windows in upstairs of Lodge. Carpeted Oak cabin. Reinsulated Lodge walls and installed knotty pine planking. Donated garage moved on-site. 2002 - Donated House (Welcome Center) moved on-site and renovation begun. Interior of Lodge renovated (new paneling, windows, lighting, etc.). Faith for the Future Capital Appeal began. Leadership Mentoring Program begins. American Camping Association (ACA) accreditation received. 2003 - Pedal & Paddle Program begins. 2004 - The Faith for the Future Campaign continues to raise funds for a Family and Adult Retreat Center. Gifts received brought us one-third of the way toward our goal of $850,000. 2006--Luther Park was hit by 70 mph straight line winds destroying over 200 trees. Art Peterson from Nativity Lutheran received Outstanding Christian Service Award. First Breakfast with Santa at Luther Park. 2007--Developed Great Lakes Mission Trip to Duluth. First Grandparent/Grandchild Retreat at Luther Park. Had a ribbon cutting ceremony of the Welcome Center at the Summer Open House. Received 500 iPod Speaker/Docking systems that we are selling for $75 each (Sold about 200). Art Caple from Bethany Lutheran on 36th Avenue received Outstanding Christian Service Award. Board approved the combination of the Welcome Center and Retreat Center projects to create Retreat Village. 2008--New Choral Music Camp for campers Grade 6-8 in partnership with Lutheran Music Program. Moved Offices and housing for Retreat Host into Welcome Center. Completed Welcome Center Renovation. 2009 - Celebrated our 50th Anniversary (1959-2009) since the property was purchased. Kicked off the "Fit for the next 50" campaign to upgrade all facilities for the next 50 years. Sold one 2.5 acre lake lot for $250,000. Outstanding Christian Service Award was given to Severt and Joan Legred. Re-accredited by American Camping Association. Received $200,000 naming gift for a Family and Adult Retreat Center from Bethel Lutheran Church in Minneapolis. Re-roofed Program Director House on site. Began painting buildings on site. Began renovation of Fir Cabin. -Installed new power from Fir to Ash, Birch and Elm cabins. Anna Treague, long time Luther Park Program Director, resigned at the end of the summer. Kevin Schommer joined our staff as Retreat Host July 1st. Outstanding Christian Service award was given to Carl and Marilyn Johnson and Randy Johnson. Danny Bennett was hired September 15th as Retreat Host. --Pontoon boat lift was donated by Pete and Marcia Brace. --2000 Honda Odyssey Minivan was donated by Matthew and Nancy Peterson. --Paddle Boat was donated by Pastor Howard and Chris Skulstad. We received $15,000 for a new Pontoon boat, dock and other waterfront improvements from Rachel Schneider in honor/memory of husband John. New windows were purchased and installed in final two cabins (Hickory and Maple) thanks to a generous donation from Pete and Jane Hill and volunteer efforts of Pete and two of his sons. Deck on Pine Cabin was replaced by volunteers from Diamond Lake and others. Began renovation of Pine Cabin by Diamond Lake members with funds provided by Diamond Lake. Painted Hickory Cabin, with a special thanks to Art Caple for assisting with the painting of all of the buildings on-site. Ten quality Prayer Benches were donated and installed around camp by Roger King from Nativity Lutheran Church. Outstanding Christian Service award was awarded to Norma Peterson from Mount Calvary Lutheran Church, and to Sharon and Burt Miller from Richfield Lutheran Church. Installed flag pole and planter near the Lodge in memory of Dorothy Fisher Carlson with funds given by family and friends from Richfield Lutheran. Purchased new Convection Oven with funds given in honor of Paul and Ruth Bennett by family and others. Outstanding Christian Service awards to Roger and Kathleen King for donating and building the Gazebo between the Lodge and Log House; and to Bob Kresse and members of Diamond Lake Lutheran Church for providing the funds and volunteers to renovate Pine Cabin. Completed the renovation of Pine Cabin. Reconstructed the Ropes course thanks to House of Prayer Lutheran Church, which provided the volunteers through a mission trip, and also provided the funds for the costs for materials. This is a wonderful improvement to our program offerings. Began the renovation Ash Cabin, thanks to funds and volunteers from St. Barnabas Lutheran Church. Tara Jo Hill became our Retreat Host/Summer Program Director. Luther Park received a bequest of nearly $56,000 from the estate of Lorraine Olson. Lorraine was a long time member of Zion Lutheran Church in Minneapolis. Re-roofed the Log House, thanks to Sev and Joan Legred for providing $15,000 for improvements to the Log House, as well as the wonderful volunteers who came up and helped make it happen. Especially Dave Rice, a member of Mount Calvary, who came up and helped from the beginning to the end of the project (we finished while it was snowing, which turned out to be a 20" snow fall! A new entrance sign was created and purchased (and installed!) by Tom and Janet Nelson of Elim Lutheran. Anna Treague became Associate Director. Began Night Owl Camp for Junior/Senior High Tree House Camp. Outstanding Christian Service Award given to Dave Rice from Mount Calvary. Received Golf Cart in memory of Mona Legred(Joel's mom) from husband Arlen Legred and family. Completed renovation of Ash Cabin thanks to resources provided by St. Barnabas Lutheran Church, and thanks to Dave Sather, who spent many hours working on the project! We also had many other volunteers from St. Barnabas and other corporate churches. Re-roofed Pine and Elm Cabins. Started renovation of Elm Cabin. Funds are provided by Elim Lutheran Church. Received two Paddle Boards for the waterfront. A Prayer Labyrinth was built by Roger King and volunteers from Nativity Lutheran Church. Received a donation of a 2007 Volkswagen Passat. Joseph Larrivy joined our Full Time staff as the Director of Summer Program and Retreat Ministries.